CALL 815-444-8870 TO SPEAK WITH A SALES ASSOCIATE TO FIND THE RIGHT SCOOTER FOR YOU. SCOOTERS IN STOCK AT STORE TO TRY! LOWEST PRICE ONLINE PLUS WE'RE A PHYSICAL STORE TO GO TO IF WARRANTY AND REPAIRS ARE NEEDED. The Prowler 4-Wheel Heavy Duty Scooter was designed and constructed with outdoor use in mind. 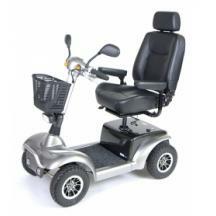 Sporting a full suspension, pneumatic tires, a high ground clearance, and rugged 4-wheel configuration, there is almost no terrain that this scooter cannot conquer. Have the freedom to go where you need at your speed, with a max cruising range of 7 MPH, a top range of 23 miles and 500 lbs capacity. Anti-tip wheels, a headlight, rear view mirrors, and turn signals outline some of the safety features that come standard with the Prowler. 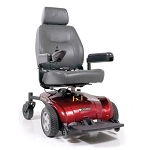 A luxurious reclining captain seat with contoured cushions and backs provides you with regal comfort. 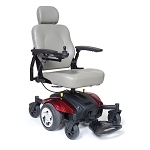 Almost everything on this scooter is adjustable - The seat is height and depth adjustable, the padded flip-up armrests are removable and height/width adjustable, and the tiller angle adjusts so you can sit back relaxed in whatever position you feel comfortable while traveling on your Prowler 4-Wheel Heavy Duty Scooter.